Byron Bay’s laid-back lifestyle provides the perfect environment, not for only surfers looking for great waves, but also the creative minds of artists who thrive in this atmosphere. If you are planning a camping holiday to Broken Head Holiday Park, be sure to include the Byron Bay art scene on your list of things to do, you won’t be disappointed. Start your journey of discovery by going on the Byron Bay Arts Trail. The trail takes you through the Arts and Industry Park where you can visit lots of galleries, studios and showrooms, many of which will give you a chance to see Byron Bay artists at work. Be sure to grab a map that guides visitors to participating studios as well as coffee shops and restaurants in the park. As you walk along, look for flags marking the Arts Trail locations. The trail offers a chance to see such artwork from ceramics and glass art, to painting and sculpture. This Byron Bay art gallery, located in Jonson Street in the centre of town, is known for presenting work from both established and up-and-coming artists from all over Australia. Not only does the gallery have a great list of represented Byron Bay artists, but it also features guest artists through exhibitions. The gallery also hosts artist talks, workshops and discussions as part of the exhibitions. Three exhibition spaces make up the Retrospect Galleries where visitors can see all types of Australian art. Byron Tik: A newer studio in the Estate featuring Tik’s paintings, drawings and prints. Colin Heaney: Glass jewellery, homewares and a fashion line of digital art on fabric. Into the Woods: Felt art and classes. The studio is open Monday-Saturday 10am to 4pm and runs classes for children. Contact sandivalerio@bigpond.com for more information. Byron Designworks: Art, homewares and custom-made furniture made by local artisans who utilize recycled Australian hardwoods. This retail art establishment , also in Jonson Street, supports indigenous Aboriginal artists and provides a place from them to sell their work. A local family whose roots come from Yaegl, Bundjalung (Bandjalang) and Gumbainggir tribes runs this outlet. Their goal is showcase authentic indigenous art and products that will interest regional and international travellers to the area. The store features such items as jewellery, homewares, crafts and, of course, Byron Bay art. David Young is a professional photographer who lives in Byron Bay. He works for local, regional, national and international clients, including Vogue Living, GQ and Harpers Bazaar. Sean O’Shea is a photographer and artist who uploads many of his photos of Byron Bay on his Facebook page and Instagram account. Kelly Sullivan is a Byron Bay artist who creates mixed media works and paintings. Her Facebook page features her modern, pop art and reflects her graphic arts background as well as her 1970s and 80s childhood. If you enjoy viewing great art (and even buying an artwork or two! ), then Byron Bay is an excellent place to visit. Between the Arts and Industry area and other local galleries and outlets, you’re sure to find your favorite type of art. 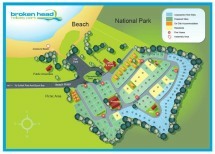 When planning your holiday, consider Broken Head Holiday Park for a place to stay. Our Byron Bay budget accommodation provides an excellent base for your holiday so you can spend lots of time taking in the art and have enough cash leftover to purchase a piece to display at home!